Click image to advance through gallery. All photos by Gary Lee Miller and Deb Fleischman. 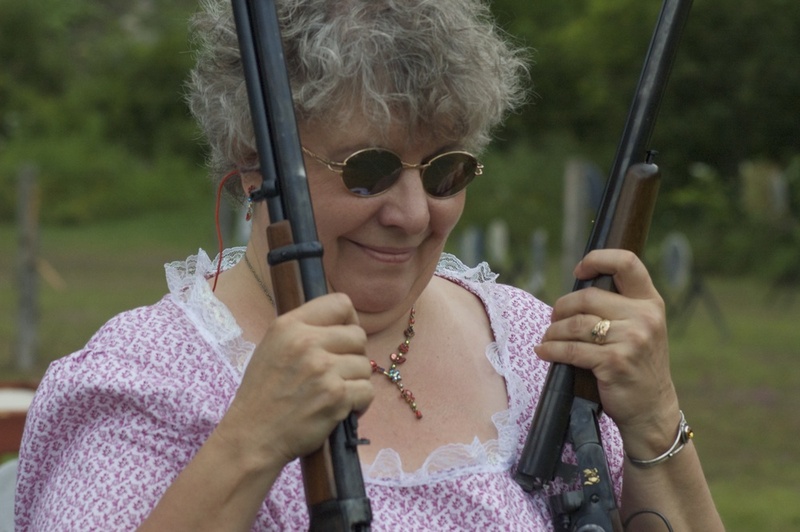 A number of years back, Deb, Eli, and took a drive up to St. Johnsbury Vermont for an event put on by the Verdant Mountain Vigilantes, Vermont's largest cowboy action shooting organization. Cowboy action, which at the time was allegedly the fastest growing shooting sport in the world, involves people dressing up as cowfolks (to be tastefully gender-neutral) and leaping with guns blazing into such scenarios as saloon shootouts, high-noon duels, and battles in the purple sage. We honestly didn't know what to expect when we arrived, but what we found were some of the most colorful characters you have ever seen indulging in an afternoon of role-play and target shooting that made the Old West look like a whole lot of fun. Let me be clear here that the first and foremost rule of the day was playing it safe. All guns were checked and handled by trained range-masters, and the only targets shot at were tin silhouettes. But that doesn't mean the participants didn't take their roles seriously, starting first and foremost with adopted cowfolk names like Witchita Wendy and Doc McCoy, and moving on to hand-tooled leather apparel and replica weapons worth hundreds of dollars. While we were there, we did a lot of shooting. Having grown up with guns, most of the shooting part was old hat for me, and I did my shooting with the camera. Deb took some photos, too, and she and Eli fired real weapons for the first time. Deb tried her hand with a six-shooter; Eli took aim with that and a rifle, too. And he learned to twirl a lariat like a real cowpoke. If you're in trouble at the OK Corral, just give us a call. We know how to handle it. Want more garyleestories? Just click the li'l arrow. In my time as a writer, I've found one thing to be true: if you're looking for a good story, go where the obsession is. I've spent time with, interviewed, and written about everyone from prima ballerinas and major league pitchers to marine biologists and luthiers, and obsession, by which I mean intense curiosity and tireless passion, was the characteristic they all shared. On Saturday, I had the pleasure of viewing the results of another obsession—this time, the obsession of Dan Barlow and Scott Baer with Vermont graveyards. For a year or better, I've watched online as the two friends' obsession played out, with beautiful—and often highly emotional—photographs of stone carving from Vermont cemeteries. But seeing their work formally displayed in the gallery at the Vermont Historical Society in Montpelier took things to another level. The photos, spanning centuries of carving tradition and supported by well-written, informative display text, tell the story of how funerary customs in Vermont changed over time as people's ideas about death and the afterlife changed. The beauty of the stones in the photos, often enhanced by the passage of decades, reveal the human spirit invested in these everyday works of art, which are truly meant to transcend time. I'd highly recommend a visit to the show, and wish the two shooters the best of luck in their goal of documenting all of Vermont's more than 1000 graveyards. Great work, guys, and congratulations. In prepping for last night's Writers for Recovery workshop, I considered a request a participant had made a couple of weeks back. He was struggling with dialogue, and he wanted some good, commonsense pointers that could help him do a better job with it. That was a request I felt sure I could fulfill. So I started looking for good materials. Now, if you've read my posts before, you know I'm a huge fan of Howard Norman. And face it, he's one of the best dialogue writers alive. I decided to look through his work to find some good dialogue I could use as a teaching tool. I didn't figure it would take long, and I was right. I settled on a passage that comes early on in The Bird Artist, when Fabian Vas's mother is trying to convince him to marry his fourth cousin, Cora Holley, whom he has never met. The dialogue is simply magnificent, with flavors of irony and sarcasm, pettiness and love, along with powerful—and deliberate—entrances, exits, and physical gestures. Sure, it was a bit complex—more blue highway than interstate as far as purpose and direction were concerned. But why not use the best example I could find? I had the text I needed, and devised a great task for participants to learn how dialogue works--they could label lines of dialogue according to whether they expressed agreement among speakers, disagreement among speakers, changes of subject, or silence. After applying these labels, students would understand these four great options for creating variety in dialogue. I photocopied the pages of text, made my way to Burlington, and, at the appropriate moment, distributed the copies, explained the process, and began to read. As I did, danger signs began to arise—sure this text was magnificent, but it was also damned complicated, and represented extreme subtlety. The writers in the class, while all extremely talented, were nonetheless beginners, and this might be too much to ask of them. Still, there was nothing to do but move on, and I did. I decided to walk them through the text, joining with them as we marked the first page or so of dialogue. That's when I discovered that the pooch was utterly screwed. Not only did the students struggle to annotate the dialogue correctly; so did I The fact was that most lines of dialogue were neither fish nor fowl—hybrids of disagreement or agreement, statements that might be ironic, but could be taken as serious, and lines that were strictly neutral, and didn't apply to any category at all. After 10 more minutes, I did what I had to do: I stopped the process and apologized profusely. To my relief (but not my surprise) everyone was completely gracious about it. And now, I have a better appreciation of 1) Howard Norman's dialogue 2) better teacher preparation, and 3) the value of a direct approach, especially with beginning writers. The interstate might not be as exciting as the blue highways, but sometimes the direct way is the best way. When it came to our garlic, we tried everything. We tested the soil through the cooperative extension, and amended it to adjust the pH and mineral content. We added compost and even tried planting it in different beds. In moments of madness, I talked to it. But still, at its best, the garlic didn’t make the grade. A third of the plants barely grew at all; the others produced, but the cloves were small and hardly worth the effort. Now we were at the decision point: should we give up and plant perennials? Or should we try garlic for one more season? We decided on one last go at garlic. But we needed a game changer, so I did what any sensible farmer would do: I hired a poet. I should be clear that employing a poet to solve our garlic problem hadn’t occurred to me prior to last Saturday. But when we walked into the Montpelier farmers’ market that morning, there sat Kevin Thorne behind his tiny folding table, mustard-colored manual typewriter at the ready. Discrete inquiries at nearby market stalls revealed that Kevin’s talents extended beyond the iambic; he’d been recently hired on to pick the fall crop at Dog River Farm. It was perfect. As Kevin tended to his other customers, Deb and I shopped. We got some great last-of-the-season tomatoes from High Ledge Farm, some delicata squash from Alen LePage, some beef short ribs from Rocio at Applecheek Farm, and (Ta-Dah!) some big, robust seed garlic from Highland Gardens. Now was the time to make my move. let us see the dreamer within. Do you hear that, garlic? Your bed is made, and it’s getting colder. It’s time to go underground, and dream of spring. Still, these quotes don't really do the book justice, because they don't speak at all to the hard work and heart Craig put into this book. For over seven years, he spent virtually all his time tracking down exclusive interviews and never-berfore-published images, and poring over skate mags, newsletters, and even posters to uncover the history of skating in the pre-Internet era and put it on paper. What he did, in remarkable detail, is bring to life the history of a sport whose creation myth, up until now, has told only a tiny fraction of the real story, and has left hundreds of skaters and their contributions hidden away. Now, thanks, to Craig, they will get their due. Congratulations, Craig! Here's hoping that A Secret History of the Ollie just knocks 'em dead. Cause it's the kind of book that happens only once in the history of a sport, and changes everything. The Internet giveth, and the Internet taketh away. That’s the lesson I learned while recently probing the Web for signs that my short story collection Museum of the Americas has made an impact. I found some great news at goodreads: a number of extremely positive customer reviews for the book. But then I noticed an odd-looking blog post advertising free PDF downloads of the book. Uh-oh. A quick skate over to a linked paged indicated that MOA was indeed available for free download, and that over 200 copies had already been nicked. It was a bit of consolation that the number was considerable, at least as far as my current sales were concerned—and that thus far, those readers had rated the book as a 7.3 out of 10. Then, of course, I started to get a little irritated. Somebody had ripped off my book! Of course, I immediately realized that intellectual property theft is something my musician and visual art friends have been dealing with for years. I figured that even though I was now part of club, but I wasn’t going to go down without a fight. I copied the URL of the offending site and sent it off to my publisher, who, I envisioned, would exact swift and painful revenge. Of course, I should have known better. It’s the Internet, right? Half an hour later Donna from Fomite Press sent me back an email. In fact, no one had stolen my book. It was simply being used as clickbait for a scam. “Sure, you can download a free copy of Museum of the Americas. But you need to register first, using your credit card number and other identity-theft-worthy data.” It was the dreaded bait and switch! And then the whole crystal palace of fraud came crashing down. My book wasn’t popular with thieves. They hadn’t downloaded 200-plus copies or rated the book a 7.3 out of ten. But then again, I guess somebody deems it clickworthy. I guess it’s time to dream up some more taglines. So when I got my book published, I figured I would do a book tour. And what's that? Well, I thought, it's about taking your book places. In fact, I've discovered that the reverse is true. When you have a book out, it takes you places. And that's one of the best parts of being an author. Friday evening, I headed over to the Madsonian Museum of Industrial Design in Waitsfield, Vermont, to give a reading. Dave and Stefanie at the museum and Rick from Tempest Book Shop had really worked hard to set up a great night, and it could't have turned out better. Some really wonderful folks turned out to hear me read. Some even bought my book, one copy of which is now headed for Australia. The event was great, but it's the little things I didn't expect that made the evening worthwhile. Such as? Such as Rick from Tempest Books walking me through the design of one of the model trains in the museum and sharing what it was like to cross the country in the observation car of a streamline train during the glory days of railroad travel. Such as Stefanie sharing her stories of owning a restaurant in Amherst, MA, and telling me the REAL story behind Marie Antoinette's exclamation "Let them eat cake." Such as Dave and Stefanie inviting me to dinner with a wonderful group of friends at the Pitcher Inn in Warren, and Dave, who designed the inn, taking us on an impromptu and informative tour of its amazing wine cellar. Without my book, none of this would have happened. It might not be a million seller, but it's changing my life. It's a burrito joint AND a reading space. I had done my work to prep for last night's reading at the Next Chapter Bookstore in Barre. I sent out the press releases. I made the phone calls and personal appeals. I posted on the FB. I tweeted. And when I arrived at my destination last evening, there were some really wonderful folks there to greet me. The only problem? One of them WAS NOT the bookstore owner. Locked out of the venue, we began to explore options. Obviously, tossing a rock through the window would draw and even bigger crowd, but it wasn't the solution. A street reading seemed edgy, but traffic created a noise problem. Ron Thompson checked out the Two Loco Guys Burrito Joint next door. They had cafe tables and chairs sitting unused in their lobby, and were glad to let us use them. Phayvanh Luekhamhan put a sign on the bookstore door informing them that the reading venue had changed. We were in business. OK, it felt a little odd at first, but we had more than a little of that ol' can-do Vermont spirit working for us, and it turned out great. I read part of the story Museum of the Americas, then took some questions from the audience. And I gladly signed some books for what I hope will be new fans. It was a great night despite the problems. Thanks, Vermont people, for being who you are. And thanks, Two Loco Guys, for giving me a place to do my thing. For a while now, people have been asking how many copies of Museum of the Americas I have sold. And I am very happy to say that thanks to word of mouth from you and great reviews in the local media, I have broken into the triple figures!! Of course, I don't want the book to stop there, because I want people to read it. So please, if you read the book and enjoyed it, please share that info with your friends and family, both on social media and in person. And if it's time to buy a reader friend of yours a gift, consider Museum of the Americas. I'll be glad to sign a copy if you are local. And thanks again for all your love and support! (click image to advance to next one) OK, it's Tuesday mid-day, and I am still obsessing about the bridge jump photos I shot in Waitsfield, Vermont on Saturday. When I pulled out my trusty iPhone, I just wanted to test out the rapid-fire feature to capture guys jumping off the bridge. The phone did a great job of that, capturing probably a dozen crisp photos during each jumper's thirty-foot or so descent. But it's only when I looked at the photos later that I began to obsess about them. If you click your way through the gallery above, you can see why. It's not the jump itself that interests me, but the stunningly beautiful shadows the jumpers cast on the wall of the bridge. At first, the simple beauty of those shadows interested me. But then I began to dig deeper in a metaphorical way. After a bit, I realized something critical about those shadows: if the camera had not caught them, I would not have seen them at all. The naked eye is a lens, but it's connected to a filter called the brain, which constantly focuses on what it perceives to be the most important data. My brain told me the jumper was the most important thing, and filtered out the shadows altogether. The more I though about this, the more I realized that one of the duties of art (and perhaps the main duty) is to filter out the obvious, most important thing, and to focus on what usually goes unnoticed. We all can see and understand the obvious, the clearly-delineated black and white of our existence. But it's the beautiful shadows that an artist brings to the fore, to share with us all. Yesterday I had the good luck to find myself sitting across the table from talk show host Mark Johnson at WDEV Radio in Waterbury, Vermont. I have been a fan for years, and have long admired Mark's evenhanded and levelheaded approach to talk. But as our long and winding interview progressed, what really struck me about Mark was the curiosity and enthusiasm that drives it. As I rambled on (hopefully coherently) about topics ranging from the origins and themes of my stories, the courageous work of the people in Writers for Recovery, my father's work life, and my vintage toothbrush collection, Mark was furiously scribbling on a sheet of paper, making notes for followup questions, possible future guests for the show, and who knows what else. The whole time, despite all the effort to keep ahead of the conversation and formulate intelligent questions, he was smiling. Perhaps due to my experience with the blather and bluster of much of talk radio, I had never considered it an art form. But watching Mark at work made me think seriously about that. In a way, he is the antithesis of corporate talk, that really has no interest in what people think, but only wants to convince them to think in exactly the same way. What makes Mark a great talk host is that he works like an artist: he follows his burning curiosity wherever it leads him, without an agenda. I am so thrilled to have been a part of his world, if for only an hour. Writing is often described as a lonely pursuit. I think at times it can be, but not for the reasons you might think. Sure, a writer works in solitude, but there really isn't any other way to do it. And if you talk to writers, you'll find that most of them are constantly battling for more solitude, not less. Oddly enough, I think, the problem comes when one emerges from that solitude, when we find ourselves still struggling with the work we are trying to get done, the technical issues raised by that work, and the enormous weight of self-doubt that plagues us all. The only people we can talk about this with are other writers, but we don't always have writers in our company. Hence, the loneliness. That's why last week's Vermont College of Fine Arts postgrad writer's conference was such a thrill. For a whole week, I got to spend time with some of the best writers (and best people) on the planet. It was a week of utter indulgence, a time to just talk about, think about, and learn about writing, and a time to push back the demons of self-doubt and prepare for the battle ahead. Thanks so much to Ellen Lesser and Jericho Parms for putting on an amazing conference, and to all the wonderful teachers, including the dynamic Steve Almond, who led our workshop with humor, generosity, and grace. And thanks especially to my fellow students, who I still felt beside me as I sat down to write this morning, a little less lonely than before. You are my people, and I am glad to be with you on this journey. New York System Hot Weiners! (click image to navigate slideshow.) We just went on our annual vacation to Rhode Island. The beaches down there are beautiful, but as I do on all vacations, I was on the lookout for a different type of amusement: vintage neon and hand-painted signs. They have been an obsession of mine for many years, and I am always exited to find a new subject to shoot. While reading a Providence Journal article about historic preservation in Providence, I saw a shot of the majestic New York System Hot Weiners sign in the city's Olneyville neighborhood. And on our drive home, we dropped into Olneyville so I could shoot the sign. I am not a great shooter, but the light was great, and I captured the images you see here. Even better, the Hot Weiner shop is still in business, offering its trademark dogs slathered in mustard, diced onion, and chili/burger sauce, along with fries, burgers, and Del's lemonade. Eli and I opted to split a special--two hots and fries with a Sprite, which we quickly devoured. The place was like walking into the 1950s, and included a chatty fry cook who told us the story of the time he almost hit it big at the horse track. All in all, it was fascinating Americana detour. Hope you enjoy the shots. And if you are ever in Providence, drop in for a hot weiner or two. Yesterday I drove down to New Hampshire on the Interstate to meet with a book editing client. On the way back, I took the scenic route. As I was cruising along somewhere near New Boston, I passed a decrepit (and obviously closed) auto dealership with an old refurbished Mustang in the window. As I passed, I spotted a couple other cars scattered on the property, so I turned around and circled back. Kicking myself for not bringing my 35 MM camera with me, I took these shots on my iPhone. I'm not sure what it is about decay that draws me. I think it has something to do with imagining the lives that have been lived before. Why are these cars where they are? Who owned them and this fallen-down barn and dusty shop where they're stored? What lives were lived in them, and who did they serve? This is the kind of thing that really gets my imagination going, and why I love taking the back roads. It's also why Museum of the Americas is stuffed full of old Igloo-shaped tourist cabins, Ford LTDs, roadside museums, and fallen-down barns. It's also why I spend a fair amount of my spare time photographing old neon, old motels, and hand-painted signs. It's about lives passing, lives lived, and lives preserved in what is left behind. And I like it. "And then I asked him with my eyes to ask again yes and then me asked me would I yes and his heart was going like mad and yes I said yes I will yes." Inside the envelope, I found the greeting card shown above, a thank you from my friend Amy Jollymore for my contribution to her Indiegogo campaign. She's publishing the Kind Self-Healing Book, and you can read about it here. Why is Joyce stalking me? Would he have been better off with Indiegogo? All questions for the future. For now, I am eating lunch and waiting for the rain to stop. A little over a year ago, Middle Eastern scholar Kamal Azari approached me and asked if I would edit his book proposing a new concept for democratic government in the Middle East and North Africa. I agreed, and after 12 months of intense work, Axis of Hope was born. How good is it? This week, Kirkus Review called it "a timely, serious, and original contribution to one of the most pressing problems of our time. You can read the full (and extremely positive) review here. Special thanks to Marisa Keller for her astonishing proofreading skills. Here’s a photo of my book, Museum of the Americas, on the shelf at Bear Pond Books in Montpelier, right next to Howard Norman’s new novel, Next Life Might Be Kinder. That my book is in Bear Pond at all means a lot to me; it’s one of the great indie bookstores on Earth, and it’s in my adopted hometown of Montpelier. That my book sits on a shelf next to Howard Howard Norman? Well, that’s a whole other level of joy. I first met Howard Norman in 1994, when I was an MFA student at Vermont College of Fine Arts, and he was a visiting writer. His novel The Bird Artist had recently come out, and when he read from it, every nerve ending in my body lit up. The tale unspooled with a disarming simplicity. First came the words, so carefully chosen as to seem almost plain, yet so rich as to conjure an instant reality, fully formed. The emotional power sank in with devastating impact just a beat behind. I bought a copy of the book that day at Bear Pond, and have since gone through half a dozen or more, pressing them like missionary bibles on readers I trust. Of course, there is more to Howard Norman than The Bird Artist. In the twenty-odd years since I first met him, I have eagerly consumed his work, from the wonderful story collection Kiss in the Hotel Joseph Conrad to his more recent four-part memoir I Hate to Leave This Beautiful Place (of which part one alone is worth the cost of admission) and his newest novel, Next Life Might Be Kinder, which evokes the tender, lamplit moments of reverie that so heartbreakingly illuminate Norman’s prose. All of these, of course, have shaped the course of my own writing, in ways large and small, successful and less so. But it is The Bird Artist that has shaped the course of my life. I have been with my partner Deb for eight years now, and our life together with our little family—my daughter Maddie and Deb’s son Eli—mean everything to me. Yet without The Bird Artist, none of this might have been. In its earliest days, the relationship between Deb and me grew deeper around the novel, which I read to her aloud in bed during an autumn’s worth of evenings. Since then, this ritual has been repeated at least once, possibly twice, although neither of us remembers. It seems that in our relationship, the story of a quiet, bookish Newfoundland bird artist and his love for a beautiful, headstrong young woman has always been there. When I walk into Bear Pond on a hot summer afternoon, dip into the coolness and the buttery light, the familiar squeak of floorboards and a universe of art spread out before me, that alone would be enough. But to see my first story collection placed beside a work by Howard Norman seems more than I could ask for in this life. Before the snowboard, Vermonters had the jumper. According to the woman who sold it to me, it wasn't easy to get the hang of it, but once you did it was pretty awesome. The gleam in her eye told me she wasn't lying. I am thinking of bringing this to the Bear Pond Pop-Up Museum on August 1. It only gets better if you bring something cool, too. So....what will you bring? Y'all Are Invited to My Bear Pond Reading! Which pop-up item should I choose? It's a book party, reading, and pop-up museum in one! Hope to see you there! 1. Each guest is invited to bring one small, personal artifact for temporary (one night) display in the Bear Pond Pop-up Museum. You can drop your artifact off any time August 1. We will provide a display card you can use to label it. The idea is that everyone will use one artifact to tell part of their life story. 2. The pop-up museum will open at 4 PM. I will be there to sign copies of Museum of the Americas. I'll also give a brief reading at 7 PM in the children's room upstairs. At that time, the Bear Pond Pop-up Museum closes forever! Ok, so here is the big problem with having Carley Stevens-McLauglin shoot your author photo: you will probably never look this good again in your life. The shoot was one of the most fun afternoons I have had in while--lots of time to sit and talk and drink coffee beforehand, and a no-fuss, totally relaxed photo session that made me feel completely comfortable. I have never been one to shy away from the camera, but let's just say that results may vary widely, and generally for the worse. But not this time. Thanks, Carley, for your amazing skill, your generosity, and your personal warmth. And thanks most of all for making me look my best at a time when I really need to do just that.